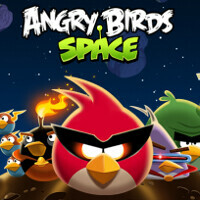 For the first time since September, when Rovio added 35 new levels to the game, Angry Birds Space has been updated. The new update, which takes the game to version 2.0, adds 50 new levels. There are also new bonus levels and features such as a gas tank and meteor showers. The title, once the fastest growing mobile game ever, hit the 100 million downloads level exactly two years ago today. The Angry Birds have become a marketing icon, with their fowl images seen on everything from lunch boxes to adhesive strips. But in terms of actual game play, the Birds have "jumped the shark" (Google it). Consider how Flappy Bird became such a hit with a simple, yet addictive, game. But if you still have a thing for Angry Birds, and still play Angry Birds Space, it will cost you nothing to pick up the 40 new levels for the new Beak Impact episode, and the 10 extra bonus levels. The update can be found in the Apple App Store and the Google Play Store. LOL. Judging by the comments, I'm guessing you guys aren't playing this anymore?